CHARLOTTE, NC—More than $140,000 was raised for deserving young scholars at the 2017 UNCF Maya Angelou Women Who Lead Luncheon on Saturday, Sept. 23. More than 400 business, civic, and education leaders, including Charlotte's mayor, The Honorable Jennifer Roberts; actors Julian Brittano, of OWN’s network series “Greenleaf,” and Maria Howell, of the award-winning movie “Hidden Figures” attended the 15th annual event at the Westin Charlotte. This year’s Maya Angelou Women Who Lead honorees included the Honorable Yvonne Mims Evans, North Carolina superior court judge; Carlenia Ivory, city council member, family engagement specialist and community advocate; Jada S. Grandy-Mock, SVP, CRA strategies director south region, Fifth Third Bank; Moira Quinn, COO and SVP of Communications Charlotte Center City Partners; Tanya Blackmon, EVP and chief diversity and inclusion officer, Novant Health; and Toni L. Freeman, EVP Arts & Science Council. These local “She-roes” were honored for exemplifying outstanding leadership in their communities, paving the way for the next generation of leaders. 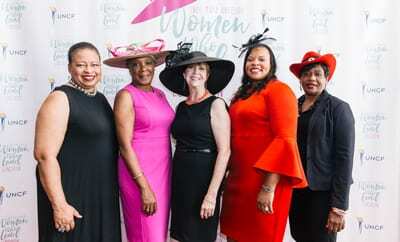 The event, emceed by Cherise Belnavis Johnson, featured a crowd favorite HATitude and Bow Tie competition, shopping, networking and much more. Proceeds from the event will provide necessary resources to North Carolina students and UNCF-member institutions in North Carolina: Bennett College, Johnson C. Smith University, Livingstone College, Saint Augustine’s University and Shaw University. With the support of long time sponsors, Wells Fargo and Novant Health, this year’s event was a huge success. To view images from the luncheon, please visit: UNCF.org/charlotte.